All proceeds of this event are used to benefit the St. Stan’s Athletic League and the over 300 children it serves with its sports programs each year. 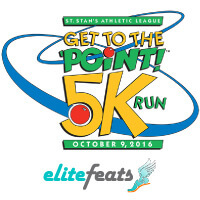 The St. Stan’s Athletic League is proud to be the driving force behind the creation, production and development of the “Get to the ‘Point” 5K Run. Over the past 23 years, our wonderful event has truly grown and developed to become one of the most popular, fun, family-oriented race events held in the metropolitan area each year. Whether you are a serious runner looking for a challenging course with tough competition or just want to come out and walk the course with friends and enjoy the fun, food, and festivities, we have something for everyone! Past events have attracted over 600 participants from the five Boroughs, Long Island, New Jersey and even Connecticut. Keep in mind that all proceeds of this event are used to benefit the St. Stan's Athletic League and the over 300 children it serves with its sports programs each year. Would you like to Volunteer or help Sponsor the event? 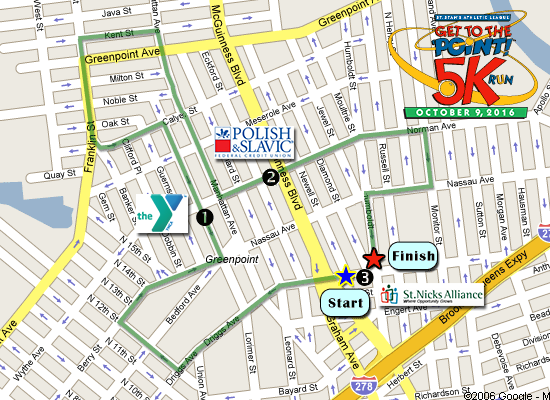 5K Run (3.1 miles) open to Runners, Joggers and Walkers of any age. 25 Yard Dash is open to children aged 2-5. 50 Yard Dash is open to children aged 6-9. 75 Yard Dash is open to children aged 10-12. All race day registrants for the dashes and 5K run will receive admission to the Post-Race Party, but T-shirts will only be available while supplies last. All runners must check in at the St. Stan's Athletic League, 189 Driggs Ave - Parking lot, where they can pick-up their official race number and T-shirt. Dash Entrants: Check-in by 10:00 a.m.
5K Entrants: Check-in by 12:30 p.m.
5K Run: Overall Male/Female winner, plus top 3 Male/Female finishers in each age group will receive trophies. Top three Male and Female finishers in each age group will receive special medallions. 25 Yard Dash: 2, 3, 4 and 5. 50 Yard Dash: 6, 7, 8 and 9. 75 Yard Dash: 10, 11 and 12.